Choosing paper for your fountain pen can be a bother until you find the one that really hits the spot! 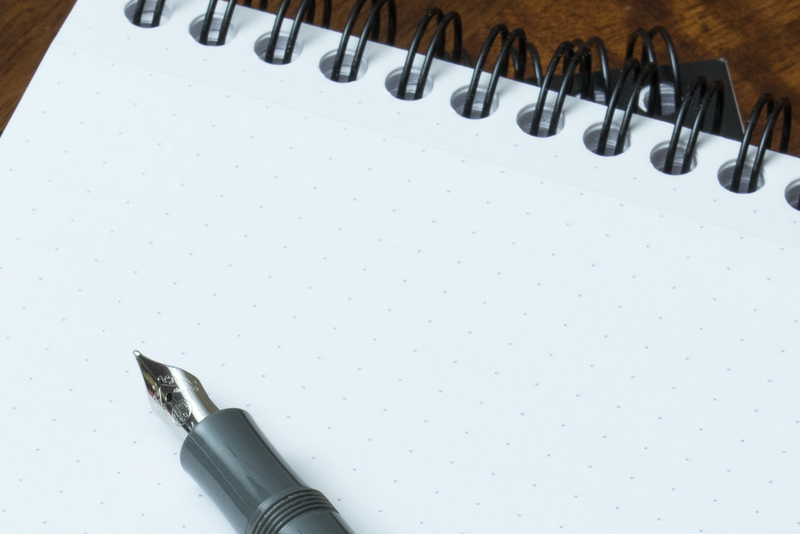 But do you know exactly what to look for in a notepad? Not all paper is created equally and oil based inks found in ball point pens allow more leeway when shopping for paper. Water-based fountain pen inks exhibit a number of unique qualities that can cause strange effects if your paper is less than ideal. So how do you find a paper that works for you? We've outlined six things to watch out for when buying your paper. Paper comes in many different textures. Depending on the manufacturing process you may have smooth, linen, laid, felt, cotton and a myriad of other textures. The choice of paper depends on its use. Will it be printed on, used for drawing and sketching or for kids at school. 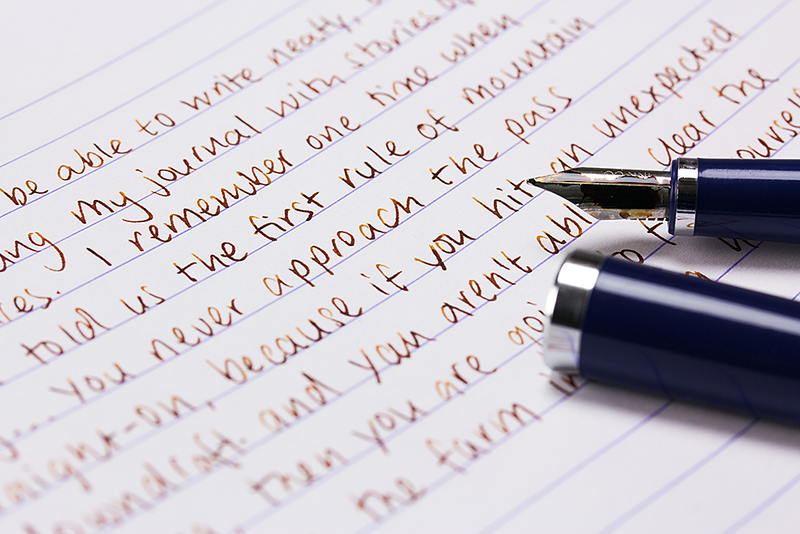 For the fountain pen user you are best to look for a paper that is coated and smooth. Your nib will glide over the surface and lay down a lovely line! These smooth papers tend to be advertised as having a smooth or smooth satin finish and will usually be branded as being of a higher quality. Dots, lines, squares or none? Perhaps you prefer French ruling (Seyes) for working on your cursive? Determine the type of ruling you’d like in your notebook. I select my paper based on the application but some folks have a real love of one particular type. Dot paper has been a recent favourite of many writers while the most popular still appears to be lined. If you’re a scientist or someone who plays with numbers, consider squares. And of course fountain pens can be used for sketching and art where no lines are required. Ink comes in all sorts of flavours with regards to drying time. Some ink dries very quickly and some very slowly. Nonetheless, paper can have a big impact on drying time. Smooth coated paper that are fountain pen friendly tend to exhibit longer drying times because ink dries naturally through evaporation rather than absorption. Rough uncoated paper tends to soak the ink up and dry more quickly. Sounds great, but read on about bleed-through and feathering before you make your decision! Remember that rough uncoated paper I mentioned? Bleed-through is a common problem exhibited by this type of paper when used with fountain pens. If your paper is thin, bad quality, or absorbs ink then there are possibilities for bleed-through. You’ll know you have bleed-through when you put pen to paper then flip the page. Can you see ink seeping through? That is bleed-through. It’s not a great to see and certainly stops you using the other side of the page. By choosing a higher-quality smooth finish paper you may see ghosting, where you press on the page and see the letters outlined on the other side, but you shouldn’t see bleed-through. If you hate ghosting then consider a higher weight paper or pressing a little lighter (after all, these are fountain pens folks - no pressing required). Spiky tendrils keep you up at night? They do me! It could be giant octopuses but it's most likely feathering. When putting fountain pen to lower quality paper you may see spikes or thin tentacles appearing from your letters. Lines may also show thicker than you think they should. Lower quality paper or more absorbent paper tends to soak up the ink in interesting ways causing a less than pleasing look to your lettering. Once again, higher quality coated paper is designed to be a fountain pen’s friend and prevent feathering. White. What more can I say. Pure white. If you want to see the true colour of your inks then choose white paper. But white paper can be bright and hard on the eyes, so if you do write a lot consider a cream or ivory paper. Ink colours may appear a little differently and can give some neat effects. At Knight's Writing Company we heartily recommend Rhodia, Clairfontaine or Leuchtturm1917. Our preference is an A5 notebook for bullet journaling or writing down your memoirs, but we stock many different sizes. Be sure to take a look. Do you have a favourite paper? Love my A5 Leuchtturm ruled notebook, but I would like to give the dot version a try someday. I find Leuchtturm paper to take fountain ink very well, allow the colour of my chosen ink to flourish with very minimal feathering or bleeds through. It’s a true pleasure to write in. Hi! Which pen/nib and ink are featured in the first picture? Thanks! That’s a Noodler’s Ink Nib Creaper in navy blue.